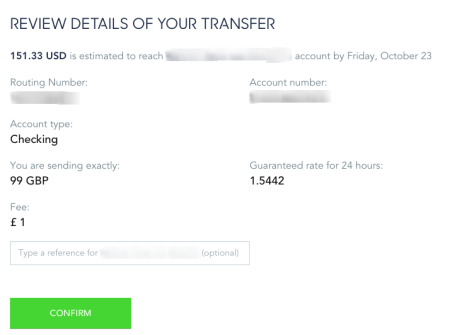 Having made my fair share of international transfers, I was mildly blown away by the speed and simplicity of TransferWise. For this very type of transaction, it blows banks, Paypal and yes (with the limited liquidity in markets) Bitcoin out of the water and is part of the reason I’m convinced Bitcoin isn’t a viable solution for remittances yet. I decided to take step-by-step screen grabs of the process. In this example I sent 100 GBP from the UK to the US. Make deposit to TransferWise’s UK account via online banking or debit card. Ta-daa! The funds appeared in the recipient’s bank account in two days. Obviously, there are times when Bitcoin would be a brilliant mechanism (like if it got sent to a place where bitcoin is trading at a premium or for micro-transactions), but I’m convinced I’ll use TransferWise again. Give it a go and let me know if you got stuck!